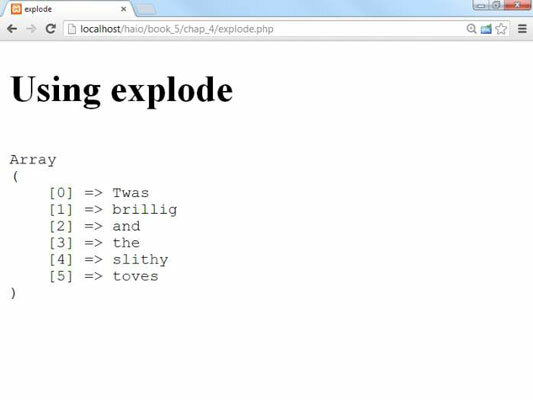 explode: explode takes one parameter as a delimiter and splits the string into an array based upon that one parameter. preg_split: If you require regular expressions, using preg_split is the way to go. split allows you to take complicated chunks of text, look for multiple different delimiters stored in a regular expression, and break it into an array based on the delimiters you specify. explode works well with comma-separated value (CSV) files and the like, where all the parameters you wish to break the text on are the same. preg_split works better for when there are many different parameters that you wish to break the text on or when the parameter you’re looking for is complex. The first value is the parameter on which you’re splitting up the string. The second value is the string you would like to split into an array. In this example, the string would be split up on each space. You can put anything you want as the split parameter. 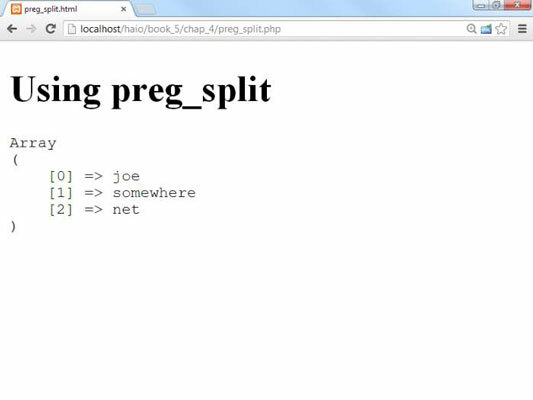 preg_split is a bit more complicated. preg_split uses regular expressions to split a string into an array, which can make it a bit slower than explode. preg_split looks exactly like explode, but instead of one character inside quotations, you can cram all the characters you want to split on into brackets inside the quotations, or you can use a complicated regular expression to determine how the values will split. preg_split works well for timestamps, e-mail addresses, and other things where there’s more than just one unique delimiter that you wish to split the string on. Earlier versions of PHP had a function called split. It was much like the preg_split function, but it used a different regular expression syntax. Hardly anybody used it, and it is no longer supported. Use explode for simple patterns and preg_split when you need the power of regular expressions.